There are many studies available but here we discuss the effect of different tempering temperatures on the microstructure and mechanical properties of high boron white cast iron after air quenching. High Cr white cast irons are an important class of wear resistant materials currently used in a variety of applications that requires high wear resistance and reasonable toughness. 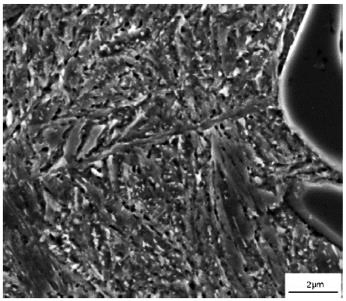 The effect of different tempering temperatures on the microstructure and mechanical properties of high boron white cast iron after air quenching was studied in the paper of C. Xiang and L. Yanxiang. The experimental results indicate that the high boron white cast iron comprises a dendritic matrix and interdendritic boride M2B that distributed in the form of continuous network and the matrix is composed of fine pearlite at as-cast condition. 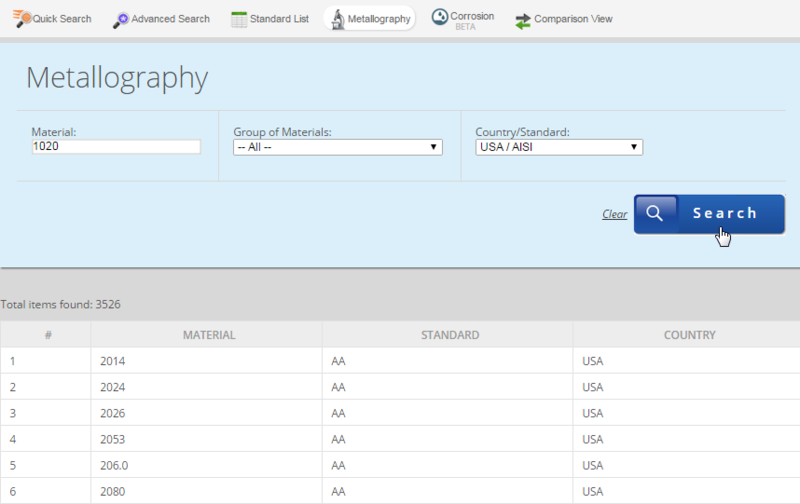 After austenitising at 920°C and air quenching, the matrix of high boron cast iron is changed from pearlite to lath-type martensite, and the morphology of boride is still kept in the form of continuous network. After tempered at 200 °C or a higher temperature, a secondary precipitation with a size of tens of nanometers is found in the matrix, and the size and the amount of this secondary precipitation increase with the increasing of tempering temperature. TEM analysis shows that the secondary precipitates have a crystal structure of M23(B,C)6. With the increasing of tempering temperature after air quenching, the hardness decreases, and the impact toughness firstly increases to a maximum value and then decreases. The optimum structure that has a combination of high hardness and high impact toughness can be obtained when the tempering temperature is lower than 400°C. White cast iron has been a kind of commonly used wear resistant material for a long history, owing to its good wear resistance, low price and easy production. In recent years, the iron-based alloy which takes borides as the wear-resistant phase is becoming an issue of great concern. 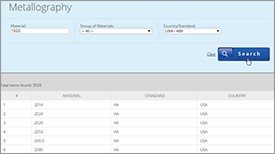 Compared with carbides, borides have higher hardness and thermal stability, which provide borides the potentials to be a kind of good wear resistant phases. This kind of material began to draw people’s attention at the end of eighties of the 20th century and had been developed in several countries since then. 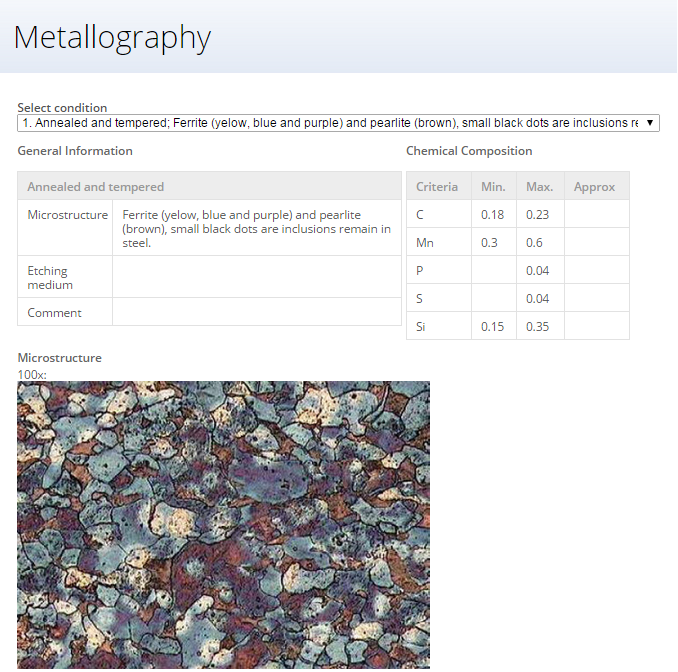 The as-cast microstructures of high boron white cast iron are shown in Figure 1. It can be seen from Figure 1 that the high boron white cast iron comprises a dendritic matrix (Figures 1(a) and (b)) and an interdendritic eutectic compound that distributed in the form of continuous network (Figure 1(c)). 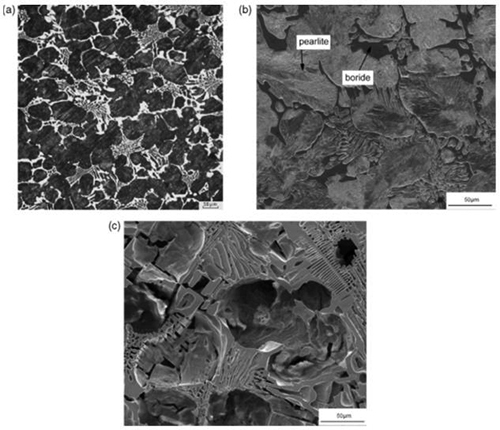 Figure 1: As-cast microstructure of high boron white cast iron: (a) optical microscope micrograph, (b) SEM micrograph and (c) the three-dimensional morphology of the boride after deep etching. 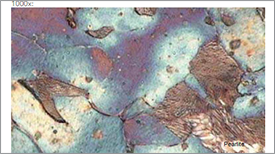 Figure 2 shows the microstructure of high boron white cast iron tempered at 450°C for 3 h, and then cooled in air. 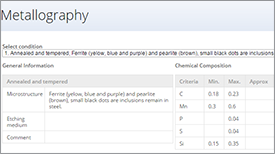 It can be seen from Figure 2 that there are a large amount of secondary particles with a size of several tens of nanometers precipitated. Guo et al. 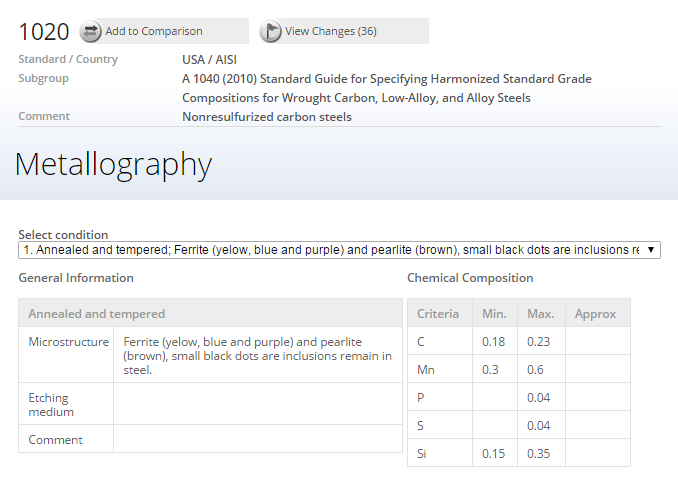 studied on the Fe–Cr–B cast iron and found that a high concentration of secondary particles precipitated from the dendritic matrix grains when the as-cast or solution treated alloys were tempered and the particles precipitated were the mixture of different kinds of boron-carbides. Figure 2: Microstructure of as-cast high boron white cast iron held at 450°C for 3 h, and then cooled in air. 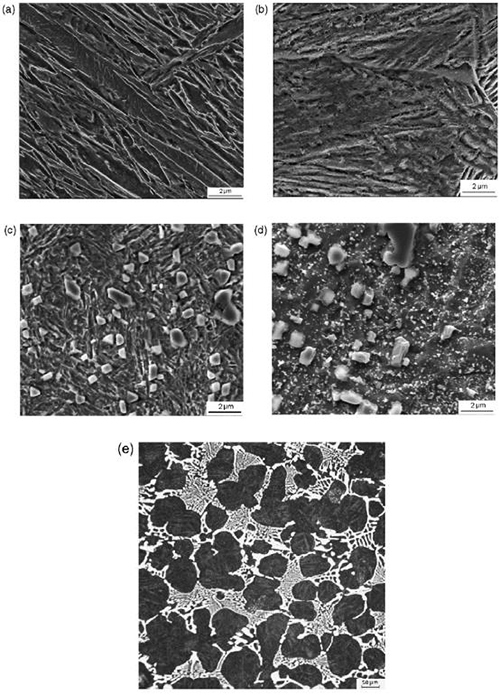 The scanning electron microscopy microstructures after heat treatments of high boron white cast iron are shown in Figure 3. It can be seen from Figure 3 that the matrix of high boron cast iron is changed from pearlite to lath-type martensite (Figure 3a), and the boride is still distributed in the form of continuous network (Figure 3e). Without tempering, there is no secondary precipitation (Figure 3a). 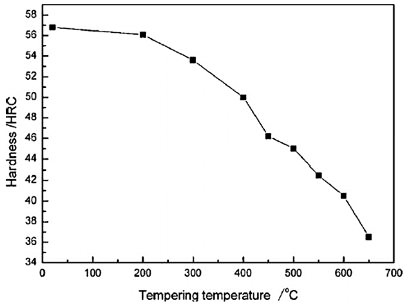 After tempered at 200°C, there is no still secondary precipitation exists (Figure 3b). While after tempered at 450°C, a large amount of secondary precipitation with the size of several tens of nanometers appears (Figure 3c), and the martensite begins to decompose. 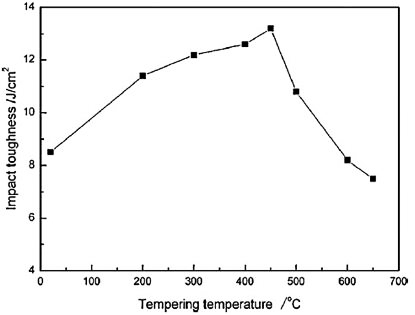 Moreover, both the amount and the size of this secondary precipitation increase with the increasing of the tempering temperature and the martensite has decomposed totally after tempered at 650°C (Figure 3d). 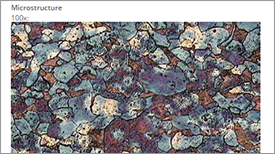 Figure 3: Microstructure of high boron white cast iron after air quenching: (a) no tempering, (b) tempered at 250°C for 1 h, (c) tempered at 450°C for 1 h, (d) tempered at 650°C for 1 h, and (e) boride, tempered at 250°C for 1 h.
The influences of tempering temperature on the hardness and impact toughness of high boron cast iron at different temperatures after air quenching are shown in Figures 4 and 5. Figure 4: The hardness of high boron white cast iron tempered at different temperatures after air quenching. Figure 5: The impact toughness of high boron white cast iron tempered at different temperatures after air quenching. 2. 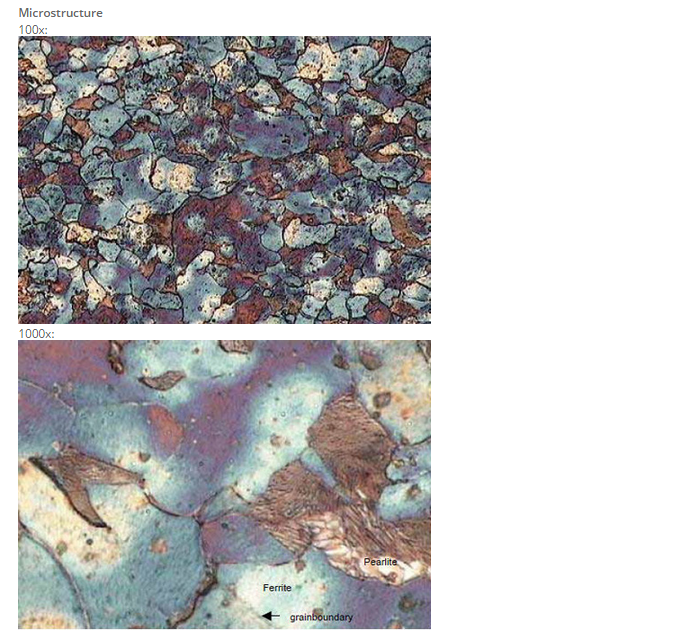 Chen Xiang, Li Yanxiang: Effect of heat treatment on microstructure and mechanical properties of high boron white cast iron, Materials Science and Engineering A 528, 2010, p.770–775.